Why the body becomes difficult to lose weight and easily fatigued? If recently you have experienced symptoms of not being able to lose weight or get rid of fatigue, it's possible that waste is accumulating in your body. When waste accumulates, the metabolism is reduced and absorption of nutrients becomes poor, creating symptoms such as those above, and the added burden of dry, rough skin. In order to discharge these wastes, it is important to promote the excretory functions of the body. Diets tend to conjure up images of restricted food intake, but these types of diets invite a potential lack of vitamins, and often have reverse effects. For a healthy diet, the intake of necessary nutrients, such as vitamin B for promoting the metabolism, and beta-carotene essential for maintaining healthy skin, etc., is important. Spirulina, which is a type of blue-green algae, contains a balance of over 30 varieties of nutrients, including good-quality protein, vitamins and minerals. Nutrients necessary for the diet, such as Vitamin B and others are also abundant. 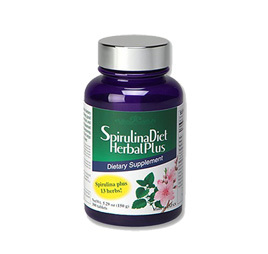 Because the spirulina expands inside the stomach, a felling of fullness can be attained. By taking 30 minutes before a meal, it is possible to reduce the amount of food intake. Nutrients known to be good for the skin, such as beta-carotene, vitamin E, pathogenic acid are also contained.The "Spirulina Diet Herbal Plus" is selective when it comes to its natural ingredients and quality.